There is a war raging in America today. A war against the thin blue line of men who stand between the rule of law and civil society on one side, and chaos and criminality on the other. A war stoked by a toxic climate of lies, propaganda, and an utterly false racial narrative. And the victims of this unjust war against law enforcement—officers of all races—are paying with their blood, while the president’s buddies celebrate online and in the streets. The first salvos of this current war were fired in August of 2014, when a black strong armed robbery suspect named Michael Brown was shot and killed by a white police officer in Ferguson, Missouri after he attacked and tried to disarm the officer. The facts of this case were then immediately and deliberately spun and altered by “eye witnesses” and a complicit media into a racial false narrative of police brutality and excessive force, claiming that the suspect never actually attacked the officer and was in fact trying to surrender when he was summarily executed in the street. The officer was of course later vindicated and cleared by local, state, and federal investigations, but truth and justice matters not to the left. “Hands up, don’t shoot” is a verifiable lie that never happened, but the false account and larger false narrative of systemic police racism and brutality lives on and has now taken on a life of its own. A life of its own that is rapidly spiraling out of control and is completely devoid of truth, facts, or objective reality. And it is this false narrative which has ultimately given rise to the radical Black Lives Matter organization and movement that Obama is so fond of. I have written extensively elsewhere about this false cultural narrative of systemic racism, profiling, brutality, and violence against black people by law enforcement, so I will be brief here. Simply put, the narrative is a total and utter lie, devoid of facts and honest and objective truth and reality. The overwhelming majority of police encounters with civilians involve absolutely no use of force whatsoever. Uses of non-deadly force by police are also very rare comparatively speaking, and are generally found to be justified and reasonable in light of the situation—despite what an utterly ignorant general public, naive to force and violence, may perceive. And finally, incidents of deadly physical force by police are extremely statistically rare when compared against the millions of police and civilian encounters that occur nationwide on a yearly basis. When such an incident does occur, the use of force is overwhelmingly found to have been legal and justified following an impartial investigation—and often times multiple investigations. Furthermore, a recent study by Harvard economist Professor Roland G. Fryer found no evidence of racial bias in police shootings. His study did however appear to show a tendency for police to use non-deadly force more often against black suspects—although it was not a huge discrepancy—however such a finding can easily be explained away by the simple statistical fact of black over representation in criminality relative to the overall population. Simply put, if black people are committing crimes in higher numbers than any other demographic nationwide relative to population, then it is not surprising that they are involved in higher numbers of police contacts which may involve the use of non-deadly force. I know that this is an uncomfortable fact for many, but I deal in truth and reality. Lastly, due to the constant promotion of this false narrative by BLM, leftists, the media, and even the president, it is no wonder that many black suspects now feel that any encounter with the police is automatically illegitimate and therefore they have the right to resist. Such a perception then only increases the likelihood for a bad encounter or use of force, and further contributes to possibly skewed numbers. But of course these are the unspeakable truths which cannot be pointed out in today’s society. And the propagation of this false narrative is not without consequence. Since Ferguson, anti-police and racial tension is at a recent all-time high throughout the country. Nationwide, the number of police officers that have been killed by firearms is up 94% from this time last year. And non-fatal assaults and attacks on police are on the rise as well. In the last two weeks, 8 police officers have been murdered and several others wounded—some critically—in two premeditated and targeted, cold-blooded ambush style attacks. These attacks in Dallas and now Baton Rouge were both carried out by radical black domestic terrorists. Terrorists who were no doubt inspired and encouraged by the “activist” organization Black Lives Matters and by the president himself who repeatedly sings the praises of the BLM organization and movement—a violent anti-police and radical, revolutionary leftist organization. But did you really expect any less from a president who is anti-American and also an avowed Marxist, black liberation theologist, and former community organizer. Since its inception, Obama has been glowingly praising the Black Lives Matter organization and movement. He has met with and sought counsel from their leaders in the white house. He has sat on public forums with their leaders. His Attorney General has met with their leaders. He has sent official emissaries to the funerals of criminals killed by the police in incidents which later proved to be justified. Furthermore, he has publicly rushed in and opined on high-profile police incidents without adequate knowledge of all the facts and before the official investigations were concluded. He has also been extremely critical and has often spoken disparagingly about the police and the institution of law enforcement as a whole. He then has intentionally deflected the blame for recent violence and strife onto his political enemies, rather than acknowledge its true nature and causes. In doing so, he has refused to call the BLM organization what it truly is: a violent, anti-law enforcement, domestic terrorist or racist hate group. Worse still, he has used the bully pulpit of his office to further broadcast the lies, propaganda, and false narrative of the organization—essentially the narrative of rampant and systemic police racism and brutality. Simply put, the president is validating and not-so-subtly encouraging a violent extremist hate-group, or those radicalized lone individuals who are acting on the ideological behalf of the movement. He is doing so through his “wink” and “nod” moral support and affirmation for the movement and the ongoing false cultural narrative. And every time another BLM inspired gunman pulls the trigger on a cop, thanks to the president, the killer will believe in the back of his mind that “the pig had it coming”. And while I don’t doubt that a part of Obama genuinely believes in the movement and the lies of the narrative, there is also a larger political agenda at play here. But I’ll come back to that later. The online petition received 141,444 signatures in just 10 days, easily surpassing the required 100,000 signatures in 30 days to receive an official White House response. And the White House did in fact respond, though their response was exactly what one would expect from the Obama White House. The response was a bunch of gooey, politically correct nonsense that, once again, ended up further validating BLM and the overall false narrative, as opposed to actually addressing the violence and death that the organization is responsible for—as the petition requested. So let’s examine this question ourselves. Once again, terrorism is defined as: the use of violence and threats to intimidate or coerce, especially for political purposes. And that explanation certainly sounds a lot like BLM. Because beneath their innocuous mission statement preaching bleeding heart social justice and equality, BLM is, at its heart, a radical and revolutionary leftist and black supremacist and nationalist organization—this is coming from their own website which I encourage you to peruse. They are ideological and strategic cousins to other well-known militant radical black supremacist/nationalist hate-groups such as the Black Panthers, the Nation of Islam, the Huey P Newton Gun Club, and the Black Liberation Army. In fact, the leaders and founders of BLM were inspired and pay tribute to the infamous convicted cop killer and BLA militant Assata Shakur—currently living in Cuba. Of course leftist defenders of BLM and other similar groups may call such comparisons and distinctions inaccurate or unfair, but would those same leftists make such a distinction between various Klan, neo-Nazi, white nationalist, or anti-government militia groups—all of which are considered either hate-groups or domestic terrorist groups by the federal government and Southern Poverty Law Center. Of course not. Similar white groups are always lumped together under the umbrella label of white supremacist hate-groups. So why should BLM be any different? Why the double standard? If a white person is seen in public throwing up the fascist or Nazi salute, then they are automatically branded as a white supremacist. But when BLM supporters regularly throw up the black power salute, this association of hate is largely ignored and the group as a whole is still coddled by self-righteous leftists, agitators, politicians, and a complicit media. So the fact remains that Black Lives Matters is a violent hate-group at best and a domestic terrorist group at worst. And this fact is quite apparent to those of us willing to see the truth. To begin with, the BLM website and mission statement plainly states that the organization stands in opposition to state violence—i.e. law and order, the civil society, and the government—and that they will actively rebel and fight against it. If openly advocating for a revolution against the state on your website doesn’t classify one as a domestic terrorist, than I don’t know what does. Especially when any similar type of white or right leaning group espousing an equivalent message would most certainly be classified—or at the very least viewed—as such. Secondly, in order to advance this agenda, BLM continually promotes the lies and propaganda of their ideology and false narrative of systemic police violence in order to inflame their current supporters and attract new ones. This is no different from any other hate-group or terrorist organization which uses propaganda, ideology, and hate in order to attract membership, incite and justify violence, and advance an overall political agenda. Furthermore, in order to advance their narrative and agenda, the BLM organization and its supporters have regularly used intimidation and threats of violence—both online and in the real world—no different from ISIS or any other terrorist organization. They have used such threats, intimidation, and coercion in order to make demands or to exert political or judicial influence—most notably in matters of prosecuting police officers perceived to be guilty in use of force incidents. They have even illegitimately hijacked political rallies and functions and accosted and intimidated political leaders in order to further broadcast their message and exert political influence. When these attempts to exert influence by intimidation fail—or even when they don’t—BLM supporters have regularly been responsible for violent and destructive protests and riots in several major cities, the result of which has been millions in public and private property damage and countless people injured. These BLM rioters have blocked highways, destroyed property, looted businesses, assaulted police officers, and chanted for violence in the streets with cries such as “What do we want, dead cops. When do we want them, now!” and “Burn it to the ground”. Additionally, BLM supporters also regularly and actively make threats and promote and encourage violence against police officers online and on social media, again no different from ISIS or any other terrorist organization. BLM supporters then regularly condone and celebrate such violence—both online and in the real world—whenever such violence against police actually comes to fruition, much like ISIS or any other terrorist group boasting and celebrating after a successful attack. Lastly, BLM leader Shaun King has even been quoted as openly calling for a coup or violent revolution if Trump wins the presidency this coming November. Again, if calling for the violent overthrow of the country does not constitute domestic terrorism, nothing does. Yet the brilliance of the BLM movement and organization, similar to other terrorist organizations, is that they can encourage and inspire lone wolf attacks through their ideology, without actually having to formally induct or recognize such individuals as “official” members. Now clearly an openly avowed terrorist organization such as ISIS does not care if they are labeled as such, but an organization like BLM trying to maintain its appearance of legitimacy does. Therefore, the larger organization is able to distance itself from any violence committed by its supporters, or by any lone wolves inspired by their cause, simply by “condemning” such acts of violence while simultaneously giving them a “wink” and a “nod”. Obama is able to do the exact same thing by “condemning” any violence against the police on the one hand, while patting BLM on the back with the other—and praising them as a legitimate, non-violent social justice activist organization. Essentially, the individual perpetrator of violence is condemned while the group itself, which is of course actually inspiring and encouraging the violence, is able to remain blameless and morally superior in the eyes of a blind public. And then there is that double standard again. To the larger cultural narrative, a Dylann Roof is representative of all white supremacist hate-groups—and all white people in general—but a Micah Xavier Johnson or Gavin Eugene Long is in no way a reflection of all similar black supremacist hate-groups or the BLM movement as a whole. To the leftist cultural narrative, the white supremacist shooter acted in furtherance of the group, while the black supremacist shooter was merely a misguided and justifiably angry lone wolf in no way representative of the larger movement. And many people in the general public believe this nonsense because most people are too ignorant or lazy to do their research or too blind and indoctrinated to see the truth. The leftist media describes peaceful Tea Party groups and Trump supporters as violent, while BLM is portrayed as nothing more than peaceful and legitimate activism in no way responsible for the violent actions of its supporters or ideologues. And this deflection of blame and condemnation away from the BLM organization only emboldens them and their supporters and encourages more violence. As does the validation and moral support and justification coming from the leftist political establishment—to include Obama himself. When aggressive and violent BLM protestors are given “space to destroy”, and BLM is absolved from the killers it inspires, it will only lead to further death and destruction. Yet as I have alluded to several times already, there is a blatant double standard here. And the absolute simplest explanation for its existence is that the left is ideologically and strategically aligned with BLM and other similar radical organizations and movements—such as the Occupy movement for example. Sure, a part of Obama and those in the leftist media and establishment may in part be sympathetic and genuinely believe in the narrative and movement, but the elites also fully understand that BLM is doing their dirty work for them. The leftist establishment is supportive of the radical Marxist ideology and agenda of BLM, but they have also strategically calculated that they can use the BLM narrative, agitators, pawns, and useful idiots to further their own larger agenda. This is the main reason why leftist power elites, such as Obama, have been supportive and complimentary towards BLM. Occasionally their attack dog may stray from the yard and bite too many mailmen, but overall it is doing its job as intended. And what is the agenda the leftist establishment is trying to further with the assistance of BLM true-believers and useful idiots? Simple, the consolidation of power. In the short term, the left knows that Obama is not on the ballot this November and therefore the Socialist Democrats need some other way to get out the black vote—Hillary has made no effort to hide the fact that she has already cozied up to BLM. So then what better way to accomplish this than through the age old Socialist Democrat scare tactic of trying to highlight phony systemic racism and oppression—this time at the hands of law enforcement and “white privilege”—and by riling up the grievance industry. Divide and conquer identity politics and division, the left’s favorite tactic. As far as the more long term and cultural agenda goes, the leftist establishment is using BLM agitators as yet another instrument of their cultural-Marxist strategy. Essentially, the further deconstruction of the country’s culture, cohesion, rule of law, and cherished institutions. In this particular case, it is the institution of law enforcement and the respect for law and order. The left is using BLM and its false narrative to smear and marginalize law enforcement, ultimately in a crusade to delegitimize it. The end game is of course to completely nationalize and centralize law enforcement, an agenda that Obama has not been coy to alluding to. If that doesn’t sound like a leftist authoritarian-totalitarian power grab to you, nothing will. 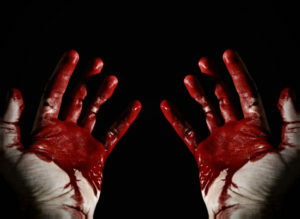 Yes, Obama has blood on his hands, and I am quite certain he does not care. He has validated the fringe, incited violence, and is now using the chaos to serve his and the leftist’s grand agenda. Strange days indeed to be alive. © 2016 By AB Frank, All Rights Reserved.